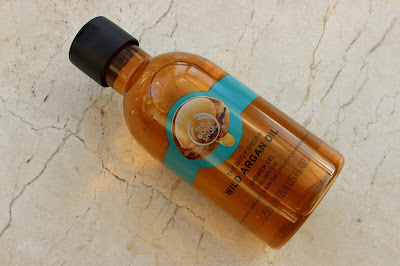 I recently picked up The Body Shop Wild Argan Oil Shower Gel because I had a voucher for the store. I'm not sure that I'd have purchased this had it not been for the voucher but I'm pleased to have had the opportunity to try the shower gel as it's a pleasant addition to my routine. Firstly, I like the packaging. The shape of the plastic bottle stands out from other brands at a similar price point and I feel that it shows that The Body Shop has put thought into the presentation, giving it a higher end feel. I like that it is transparent so that it's easy to see how much of the product is remaining and the flip top lid allows for functional dispensing. The Body Shop Wild Argan Oil Shower Gel is a pale golden colour. It's difficult to describe the scent but it's warm, comforting and slightly fruity. I found it pleasant to use but didn't notice the fragrance on my skin following my shower. The gel produces a generous lather. Despite the "oil" name, I didn't notice any skin nourishing benefits and needed to moisturise following use. I feel that The Body Shop Wild Argan Oil Shower Gel is reasonably priced at £5 for 250ml and find it enjoyable to use.